It is grilling night! John selects one of the rib eye cap steaks that I bought at Costco last week. He grills it on low until it reads 115F and then finishes it on high. In the meantime I make an Italian salad and warm potato salad. I included a carrot, 1/2 onion, and a clove of garlic as I steamed the potatoes for a little more color and nutritional value. The potato salad is dressed with some olive oil and a capful of cider vinegar, celery seed, salt and pepper. 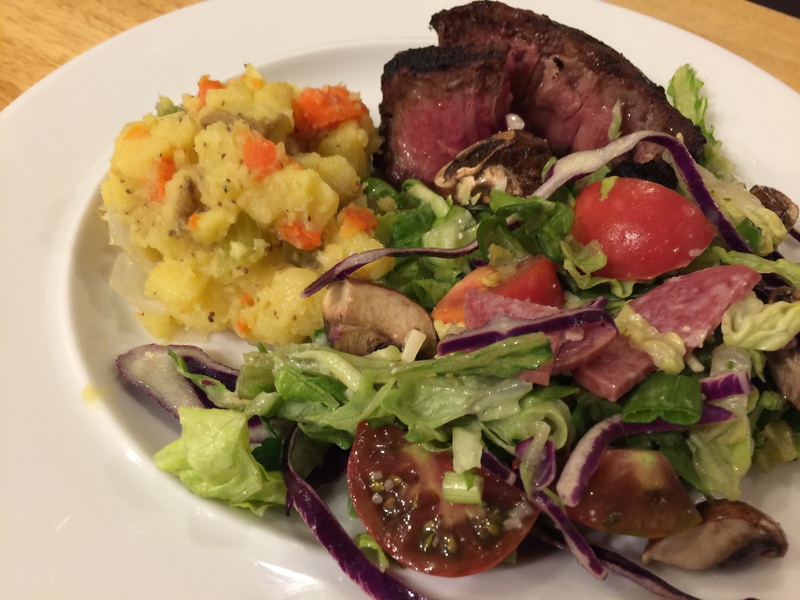 This entry was posted in Beef, Grilling, Vegetables and tagged carrots, mushrooms, new potatoes, Onions, Rib cap steak, Salad, tomatoes, Vegetables. Bookmark the permalink.